For much of Immoren’s history a trackless expanse of sand and wind and a terrifying deep chasm has divided west from east. Recently forces from either side of the divided continent have clashed with bloody consequence as a result of the Skorne Empire’s dreams of conquest. Skorne are both a nation and a people, arisen from a variety of feuding tribes that dominated the harsh and unforgiving environment of eastern Immoren. They learned to survive and even prosper despite the cruelties of their rugged lands, and their civilization has forged them into peerless warriors with a pragmatic disregard for pain and death. Warriors to the core, the skorne use dark arts called mortitheurgy to push their bodies past normal limits and to fight on past death. Even when death claims them, their souls are preserved in sacral stones to empower ancestral guardians, walking statues eager to join battle. It was a great but tyrannical human leader, Cygnar’s deposed king Vinter Raelthorne IV, who first crossed the great divide and set the skorne on their current path. Vinter came upon the skorne by accident after surviving the crossing of the wasteland between Cygnar and the east and subsequently brought them under his dominion. He became the Conqueror of the skorne by the edge of his sword, gathering an army of warriors who admired his invincible resolve. The Skorne Empire was born when he united these feuding tribes and houses under a single banner. Vinter then enticed his new army with stories of the rich lands waiting to be taken in the west. 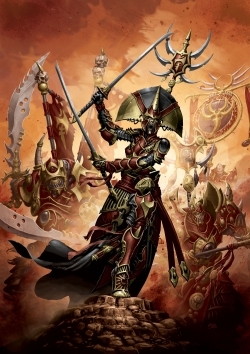 The Skorne are a proud people who have risen to embrace this unity for their own ends, led by great warlords such as Makeda, domina of House Balaash. Now that they know of the west, they have committed their armies of praetorians, cataphracts, venators, and paingivers to conquest. Their mastery of harsh environments has enabled them to settle regions on the eastern fringes of the Iron Kingdoms that humanity considered unfit for life. They are able to beset the western nations from these settlements and fortifications while the heart of their empire remains secure in the distant east.